Green Monkey Bacalar, Bacalar, Meksyk : Rezerwuj teraz! The dock by the water slowly fills with people doing their morning wake up routine, while coffee and breakfast with toast, jam and a wide range of fruits, waiting for the hungry travelers. Now the day can begin with a swim in the crystal clear water of the lagoon, or go for a tour to the best spots on the lake of seven colors by paddle-board. 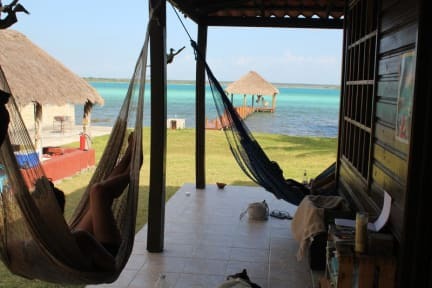 While relaxing in one of the hammocks you can see where the lagoon got it's name. You also see the entrance to the pirate's channel, marked by an abandoned bar in the shape of a ship. As you go down by the pirate channel you will see mangroves along the edge as you float with the gentle current. When you return you can visit the old ruins used to defend from pirates. You can go for a 5 minute walk to the black cenote. Wade out a few meters and look down into the abyss, then jump into it from fallen tree. Once you're hungry it's a quick to the plaza where you will find small locally owned stores to buy groceries for cooking or try the local cuisine. At the end of the day having BBQ with your fellow traveler. The hammocks and gazebos are great places to meet your neighbors in tents or dorms and make new friends. After dark you can watch the stars with your new family and fall asleep in your tent as you watch the sky through the mesh. Or try a comfy bed in either a 5 or 4 bed dorm. Or a 4 person private room. With such an inspiring place you might find a forgotten love for writing, drawing, singing or meditation on the dock, while listening to the waves. 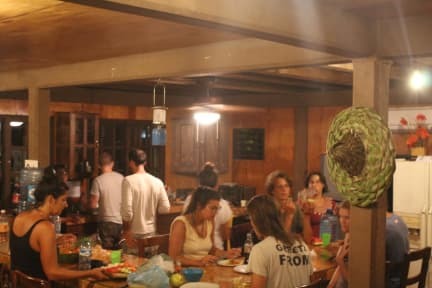 Let the Green Monkey hostel inspire you, let yourself go. Also with us you can book PADDLE BOARD tours, to visit the Bacalar lagoon and see the sunrise, Los Rápidos in Bacalar. We also make archaeological visits to the ruins of Dzibanche, Kinichná and Oxtankah. Visits to the beach of Xcalak, paddle in Xul-Ha. You can book those tours when you arrive at the hostel, make a bank transfer or a previous deposit and save your place!